The United States Mint produces one of the world’s finest proof gold coins on an annual basis in the form of the Gold American Eagle. Offered in bullion, proof, and burnished versions, the Gold American Eagle is one of the most popular coin series in the world. Today, the collector’s version of this coin is available, with Silver.com offering the 1997-W 1 oz Proof Gold American Eagle. Ships to you in a protective plastic slab courtesy of the PCGS. 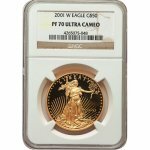 Twelfth Proof Gold American Eagle release! Consists of One Troy ounce of actual gold weight. Issued a face value of $50 (USD) by the United States government. Graded a perfect PR70 by the Professional Coin Grading Service. Available with a Deep-cameo finish. Obverse bears the image of Liberty from Augustus Saint-Gaudens. Reverse includes the family of nesting bald eagles from Miley Busiek. Bears “W” mint mark from the West Point Mint. Proof Gold American Eagles are available in a total of four different weights. The 1 oz coin was introduced in 1986 during the first year of production, with a ½ oz coin added in 1987, and a ¼ oz and 1/10 oz coin added one year later in 1988. The 1 oz Proof Gold American Eagle has always been produced at the West Point Mint, but the fractional weight coins were originally produced at the Philadelphia Mint. Beginning in 1994, production of all fractional weight coins shifted to West Point. Each of the 1997-W 1 oz Proof Gold American Eagles in this Silver.com listing has a PR70 grade from the PCGS. Coins with this grade have their full, original luster and no detracting flaws of any kind. Deep-cameo defines coins with a frosted finish on the design set and a deeply-mirrored, clear background field. On the obverse side of each Proof Gold American Eagle is Augustus Saint-Gaudens’ Lady Liberty image. In his depiction, Liberty strides confidently forward into an unknown future with a torch in her right hand as a guiding light. The reverse side of the coin features Miley Busiek’s nesting bald eagles. Used exclusively on the Gold American Eagle, her image shows a male eagle returning to the nest with an olive branch in its talons. If you have any questions about these coins, please don’t hesitate to contact Silver.com. Our associates are available on the phone at 888-989-7223, online using our live web chat, and via email. 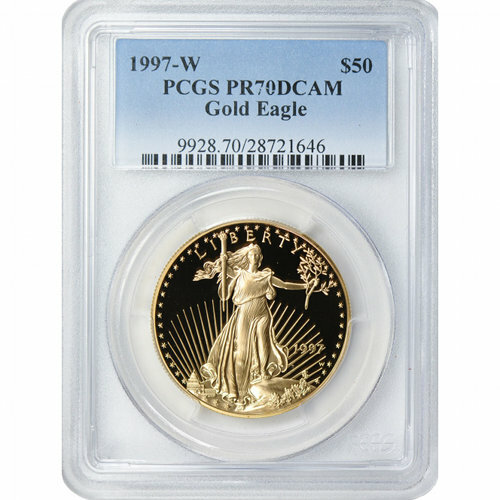 If you are looking for similar products, be sure to check out our full selection of Proof Gold American Eagles.